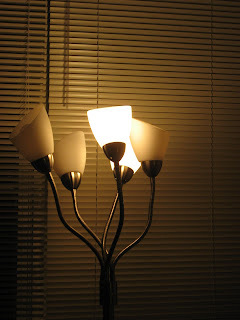 This is an incandescent bulb locate in the living area of my apartment. The fixture provides ambient lighting at different levels. The luminaire contains five bulbs, that can all be turned on at once or at different times. This light source provides enough light for tasks to be done within this space. Or just to illuminate the room. The bulbs within this fixture bring out warm tones in the illuminated space. I feel this fixture provides the appropriate amount of light needed in the space.